Background: Highly drawn ultrahigh molecular weight polyethylene (UHMWPE) is known as an ultrahigh strength material. There are few reports on the relation between the phase structure and molecular mobility depending on temperature. Objective: The purpose of this investigation is to elucidate the phase structure such as crystal, amorphous, and interphase and its temperature dependence for highly drawn UHMWPE. In addition, the phase structure of highly drawn UHMWPE was compared with non-stretched UHMWPE and high density polyethylene. Methods: High resolution solid-state 13C NMR was used to quantify the phase fraction by taking advantage of spin-lattice relaxation time (T1C). Results: The T1C for orthorhombic crystalline phase consists of three components for three polyethylenes. Highly drawn UHMWPE provided the longest T1C of all. The amorphous and interphase between crystalline and amorphous provided a single T1C’s. In addition, the resonance lines of monoclinic crystalline phase and lattice defect were also observed and these components decreased in intensity with increment of temperature. Conclusion: The orthorhombic crystalline phase in lamellar had different molecular mobility between the lamellar surface and core part. 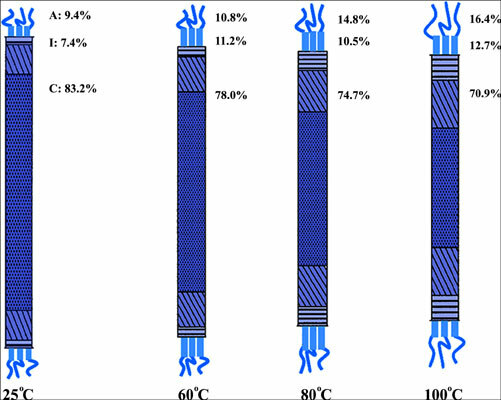 The molecular mobility of crystalline lamellar was the lowest for highly drawn UHMWPE, leading to high mechanical strength. With increasing temperature, the crystalline lamellar transformed to the interphase and then to the amorphous phase. The monoclinic and lattice defect locate in the orthorhombic lamellar phase. Ultradrawn polyethylene, ultrahigh molecular weight, solid-state NMR, phase structure, molecular mobility, relaxation time.